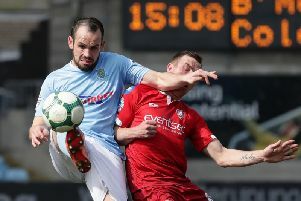 Ballymena United captain Jim Ervin is expecting another tough battle with Dungannon Swifts in the Danske Bank Premiership opener. The Sky Blues skipper knows they will be in for a real test against Rodney McAree’s men. “Yeah no matter who you play in this league it’s always tough, and I’m expecting Saturday’s game to be another tight affair, as it always is against Dungannon,” he said. “At this stage of the season no-one really knows what to expect from the other sides because pre-season games are so hard to judge. “Teams field split-squads and it’s all about giving players minutes, you can’t really read anything into the results. “But it will be completely different once the action begins on Saturday. The Sky Blues face a tough start to the new season with every fixture away from home until October due to a new pitch being laid at The Showgrounds. Ervin admitted it is not ideal, but they just have to get on with it. “Obviously it’s not ideal to be playing away from home every week,” he said. “But there’s nothing we can do about it, it is completely out of our control. “We just have to make the best of it and concentrate on playing each game as it comes along.